$51.0 (15 bids) Nintendo 2DS XL Hylian Shield Edition Console + FIVE Games! $157.99 Super Nintendo Classic Mini Edition SNES System - NES - 530+ Games MODDED! $89.95 Nintendo 3DS Systems You Pick Choose Your Color FREE Ship! Buy: $34.99 Grape Purple Nintendo Game Boy Color Handheld Console GameBoy with Case!!! $42.99 ICE Blue Nintendo DS (DSi) Handheld System! Works Great | Free FAST Shipping! $92.95 SNES Classic Mini Edition Super Nintendo Entertainment System Brand New Sealed! 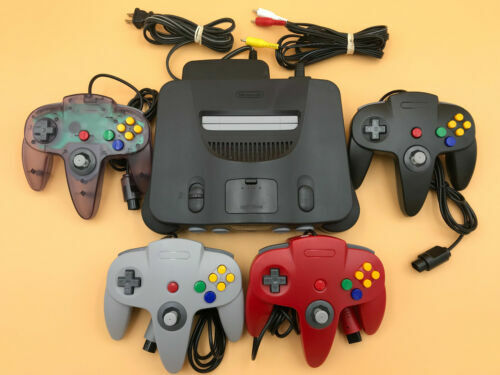 $84.95 Nintendo 64 N64 Console + Brand New Controller + Cords! LOW PRICE!